And is that a church with the dome a little to the right of the middle? Yes. Very restful. Great shot, Marianne. No, Gemma – I got in there when I first arrived BEFORE lunchtime and just nipped out for the view!! Ooh, I’ll join you enjoying the view and a nice white wine! Ahhhh…..no words needed really. Lovely! Very much so Marianne. Here’s hoping we can make it happen one day! What a glorious view Marianne. Shall we have a glass of wine or a coffee while we drink it in? Nice shot, Marianne. What a view! What a lovely view, Marianne ! We often go to Cómpeta because that’s where our ayuntamiento is. Can you tell me the name of the bar ? Thanks a lot ! And have a nice day ! Same for me, Caroline – even though we live in the campo, we come under the jurisdiction of Cómpeta, too. 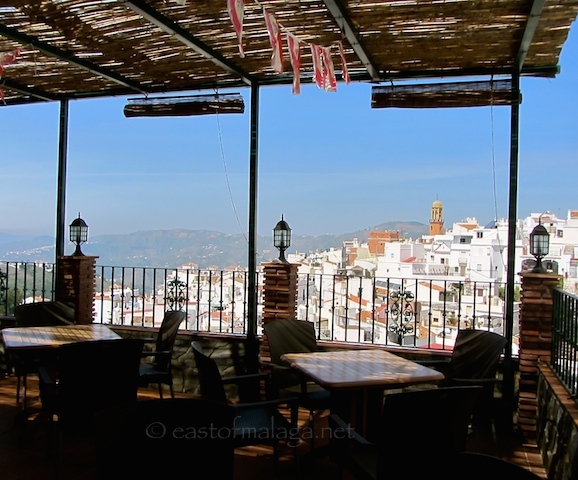 This is the terrace at Las Gemelas (The Twins) which is quite near to Plaza Vendimia as you walk towards the Guardia Civil office.